I have read everything Terry Pratchett has written(except for The Carpet People,Dark Side of the Sun & the last 2 in the Johnny series),even Where's my Cow! 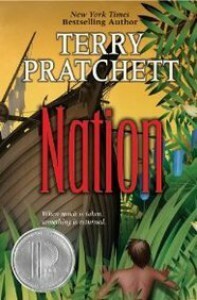 I love him and love the discworld books but I have to say this may be one of my all time favorite books by him and that's saying alot!! The story of Mau and Daphne and what they managed to overcome & learn along the way touched me deeply. I still think this should have won the Printz award instead of being an Honor winner. re-read Jan 2014 for staff picks.